Putting your legs up can help with swelling. Water retention is never fun -- but water retention in your legs is particularly bothersome. That's because water retention could make wearing your shoes uncomfortable, cause pain and discomfort while you sit at your desk for work and even when you exercise. The good news -- in most cases, water retention in your legs can be solved with just a few lifestyle and dietary changes. 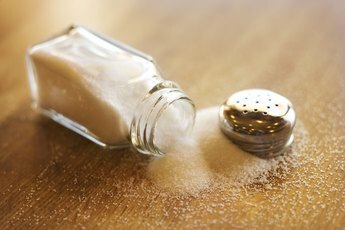 Cut down on the amount of salt you consume. Sodium causes water retention, which in turn causes swelling. Although swelling can occur in different parts of the body, it's often more obvious in the legs and feet, according to the Better Health Channel. Foods that are especially high in sodium include snacks and fast foods such as potato chips, French fries and burgers. If you're used to adding lots of salt to your food while cooking, try switching to spices and herbs to add flavor rather than using too much sodium. Stay active, as lack of exercise can worsen swelling. Mayo Clinic recommends a weekly minimum of 150 minutes of exercise performed at a moderate intensity or 75 minutes of vigorous exercise. If you work sitting down for long periods of time, make it a point to get up every 20 or 30 minutes and walk around for a few minutes. Every evening, lie down on your bed and place your legs up on the wall for 10 minutes or so. This helps relieve any swelling and pain. Drink water. If you're already drinking the recommended eight glasses of water a day, drink more. While this might sound contradictory, the truth is that dehydration causes you to retain more water, while drinking allows your body to flush excess liquid. Try vitamin B5, B6 and D supplements. According to the Better Health Channel website, these three vitamins plus calcium can help relieve fluid retention. Always talk to your doctor or a dietitian before taking supplements, especially if you're currently taking medication or have a medical condition. You can also try increasing your intake of foods rich in those vitamins, including brown rice, dairy products and legumes. If your legs appear very swollen or if you don't see any improvements after incorporating these suggestions, talk to your doctor. He can help you rule out any serious medical conditions that could be causing the water retention. Mayo Clinic: Exercise: How Much Do I Need Every Day? Does Working Out the Legs Decrease Belly Fat? What Is Potassium Good for in the Body? What Foods Contribute to Bloating?